The most precise and easy way to get lap times The new Solo 2 receives the data from two satellites constellations, GPS and Glonass: this is a huge step forward since it is unbelievably faster and more precise than the previous version and the lap times are calculated within a maximum gap not higher than 2/100 sec. With a database of more than 2,000 tracks all over the world: as soon as it switches on, Solo 2 identifies its position, recognizes the starting line coordinates of the track and starts sampling lap times. A very useful tool that not only gives you track times, but also data logging for performance analysis of both car and driver. 8mb of internal memory to record data that can be downloaded for post analysis and the ability to overlay data allows comparison of multiple events, cars & events. 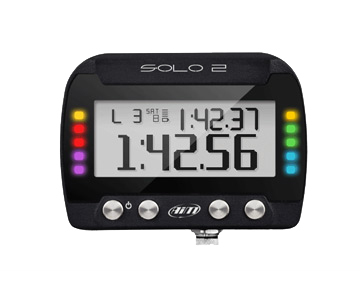 The Aim Solo 2 is an inexpensive way to make the most of your seat time.